I purchased a 3 month supply of the Viviscal Extra Strength Supplements, so I could have the recommended 3 month growth period. If my experience doesn’t match yours, then that is because everyone is different. There are no guarantees about how the supplement will perform. The best Viviscal coupon available at the moment is Save 10% on your first order. Use code Ls2aprp8 at viviscal.com. If the above coupon doesn’t work for you, you can also try VIVCOU10 at viviscal.com. In the winter, my hair grows extremely slow. My hair happens to be color treated and fine as well as being dry and porous. It is prone to breakage. My beautiful hair is naturally wavy, and if done correctly I can have curly or straight hair. When I was pregnant 2 years ago, my hair grew fast and I kept having to get it trimmed. I guess it was all the hormones that were in my system at the time. My skin, healthy hair, and nails looked amazing. Once I gave birth to my daughter, my nails started to break and my hair began to fall out in clumps. I began to panic. Then I read that a lot of new mothers have that happen and it just a side effect of being pregnant and giving birth. So, why after 2 years is my hair still coming out in clumps when I was and condition it? Why was my hair not growing as fast anymore and why was there so much hair in my brush? I believe the causes of hair loss was a combination of stress, hormone changes, and age that caused my excessive hair loss and hair thinning. According to Viviscal, stress is one of the main causes of hair problems and yes this is actually true. When you are completely stressed out, your adrenal gland will kick into overdrive and it causes an increase in adrenaline which leads to an increase of testosterone and dihydrotestosterone, which without having the right amount of estrogen to balance it out causes hair loss in women and can cause your hair to be less healthy as it should be. Then the more hair you see fall out, causes you to become more stressed. It is just a vicious circle. It is extremely hard to pinpoint an exact stress episode to find out why your hair is unhealthy, but it is normally due to chronic and acute stress that will cause conditions such as hair shedding, receding hairline, and patchy hair loss called alopecia area. I wasn’t having patchy hair loss, but I was shedding so bad, that my hair began to thin out pretty bad. There are also other reasons that can contribute to thinning hair for myself. Aside from stress, age, medications, hormonal changes, post pregnancy, and poor diet, people who have Polycystic Ovary Syndrome can have issues with their hair due to a large hormone imbalance and the increased sensitivity to male hormones, which can cause hair loss. Extra Strength Hair Growth by Viviscal is a supplement for hair growth that is supposed to help people with thinning hair, and it is supposed to support existing hair regrowth. According to Viviscal, the supplements have been created scientifically with AminoMar which helps to replenish thinning hair as well as promotes existing hair growth that is healthy. It is these nutrients that will nourish your hair as part of the Anagen phase of your hair growth cycle. Only the Viviscal supplements have a proprietary marine complex AminoMar. Basically, it is just a supplement that you take twice daily to help promote hair growth. 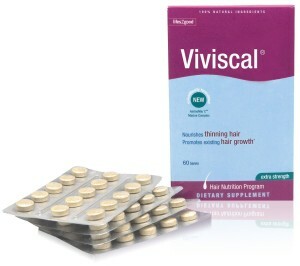 Recently I began taking Viviscal which is supposed to be a highly reviewed hair supplement that is supposed to prevent your hair from thinning. Don’t get me wrong, I’m not going bald, but I have a habit of destroying my hair to all means and it’s normal. But, I am really trying to get into that mode where I am all about beauty care. I noticed that I abuse my hair with Brazilian blow outs, body wave perms, home straightening perms, the endless color treatments, and so much more. So, when I noticed I was doing all this and my hair was thinning out, and I was shedding more than I had ever expected, I was told to take Viviscal. I took two pills per day as recommended for 3 months and I began to really see results. I am quite sure that this is because of the Viviscal. I didn’t change anything about my life during the time I started taking this. I would normally shed a lot, but I noticed that when showering, my hair wasn’t falling out as much and when I brushed it, my hair wasn’t coming out as much either. It was nice. My hair began to really grow. My hair was in the middle of my back, but by the end of month 3, it had grown to reach just above my hips. I went to my stylist and they even asked what I had been doing to get longer and thicker hair. I even noticed a huge decrease in my shedding issue. Whenever I washed my hair, less hair fell out whenever I combed my conditioner in. My hair was so much thicker and shinier, and as a side effect, which was one that I certainly did not mind at all was that my nails grew like crazy as well. I used to have strong nails, but after my daughter they began to split, break, bend, and flake. Whenever I put too much pressure on them they will break off horizontally. Since I started taking Viviscal, my nails are the strongest and longest that they have been in 2 years. All that I have been doing to my nails is shaping them with a nail file and my ridge filler before each manicure. Now this particular new hair growth could be due to my genetics, but after taking Viviscal, they became so much stronger and now it takes much more for them to break off. The one thing that I noticed is that Viviscal doesn’t make any type of statements about nail growth nor do they promise it if you take their product. Additionally, the shedding has almost stopped. I noticed that my hair grew quickly. Even when I sick for a whole month, my hair still managed to stay strong and grew like crazy. It only took me 10 weeks to grow 2 ½ inches of hair! That’s not too bad if I say so myself. Also my stylist stated that my hair looked very healthy even after box and box of hair dyes in different reds. My hair showed no signs of banding. Banding is when various sections of your hair holds on to different colors differently. The roots are less porous and strongest part of my hair now and they tend to hold color so much better now. Now that I have grown little baby hair that cause those cute little fly away’s, I have begun to learn that this product is more than it seems. I love it. I was really skeptical about it working, but it actually works and it is pretty nice. This is a fabulous product and I am glad that I got it when I did. Like with all medications, you should check out the side effects. The best Viviscal coupon available at the moment is Save 10% when you purchase a 3 month supply of Viviscal Extra Strength. Check out my Viviscal coupon page where I keep coupons regularly updated. Overall, I can say that even though it is a bit expensive, it is well worth it. Viviscal actually works, and not only has it helped my damaged hair, it even helped to strengthen and improve my finger nails. That is a plus on it’s own. I love this product. Vivscal’s biggest competitor in the hair growth market is Hairfinity. Check out my Hairfinity review and also my Viviscal vs Hairfinity page. Just keep in mind that you can use Hairfinity coupons to get the product cheaper.